My husband's 27th birthday is today, June 29, 2013. 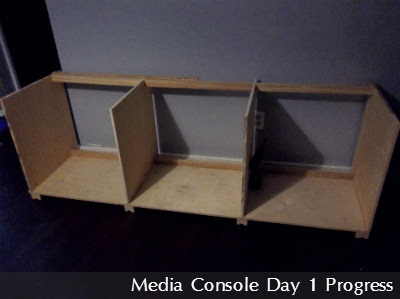 Yesterday, I mustered up some courage to start designing and building a custom media console for the home theater he designed and the electronic things in our house that he maintains. I'm not a professional builder. I've taken no courses, but I have looked at photos of consoles online. I've been drawing pictures of our console for a couple of months now, or at least, the console in my head, but yesterday was the first day I actually revved up our circular saw to cut some plywood. I didn't follow any plan for this. Quite honestly, I just made this up as I went, and will probably continue to do so because that's how the creative process works for me. So far, I used material sitting in our garage leftover from other projects, but the previous price I had paid for all materials so far is $43.50. First, I made a drawing of a basic cabinet frame, based on what I saw when the kitchen cabinets were being built, and photos I saw online. I decided on a 6ft. wide, 20" deep console, with sides and dividers all 20" deep and 22" tall. I tried to use as much wood as possible per this design, and though my rendering to the right is not to does not show exactly how much scrap material I really had left over, that was basically what the plywood looked like after I had marked it with my measurements. I noticed on my Skil circular saw that the distance from the blade and the edge of the flat plate that glides along the surface of your wood is about the width of a 1x2, so I found a scrap, abused 1x2 and used it as a measuring guide. Next to it, I screwed in leftover, primed, but unpainted baseboard to act as my removable rip fence. Then, with intimidation at the saw's power, I sawed through my measurement lines holding the flat plate against the fence to prevent binding and saw-related injuries. It took me the afternoon to cut 4 sides/dividers and one console bottom with my circular saw, especially when my daughter would sneak away from grandma and I had to pause in my saw work. I used a miter saw to cut the electrical moulding 20" each as feet under each side/divider. While my daughter took a nap, I carried all of my cut pieces upstairs, drilled pocket holes in the sides/divider bottoms only, and screwed them to the base using a carpenter's square to help me keep the vertical pieces plumb. I would have liked to have had enough 3/4" plywood for the box (carcass), but since I only had enough 1/2", I thought I would try. It needed much support, so I used 1x2 for 3 purposes. First, the 1x2s keep the sides/dividers equidistant from top to bottom, since I measured a piece to attach near the base and near the top at the same width. Second, I inset the 1x2s by 3-1/16" to later serve as a cord cubby, since we have cords and wires galore. Thirdly, with some back support, the wide 2 ft. boxes are much sturdier. 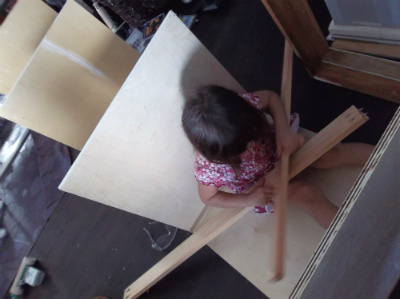 Sturdy enough to serve as my daughter's own train car when she woke from her nap. She sat down as conductor of the engine, and called "All aboard" while I prepared for 1x2 attachment. :) Then, I decided it was time to call it a day.